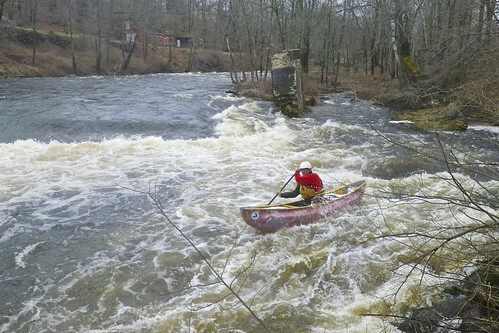 It has become a tradition for me to paddle the spring release on the Upper Millers. I ran this river for the first time with long-time P-netter Wickerbut back in 2007. Since then it has become one of my favorite trips. 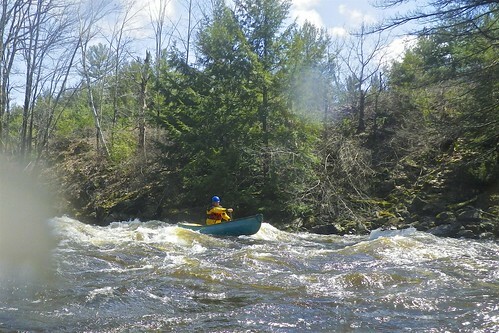 There are two sections of the Millers that are popular for whitewater boating – the Upper Millers from Royalston to Athol (class II/III), and the Lower Millers from Erving to Millers Falls (class II/IV). The open boaters outnumbered the kayakers in our group with 9 canoes and 3 kayaks. If you are a Millbrook Boat fan, there were plenty – 1 Blink, 1 Shacho, 2 20/20’s, 2 Outrages and a tandem Prowler. Dan was paddling a Silverbirch, so I was feeling a little old-school in my Dagger Encore. The day was warm, but started off cloudy and rainy. The gage was off-line, but the typical release is 1,500 cfs, and it was at least that. Some of the crew put-in at the Birch Hill Dam and ran the broken dam above the usual put-in. I opted to take some pictures. At this level, the trip alternates between class II and III rapids, with some quiet water in between. I spent most of my time dodging rocks and dumping out my boat. By the time we reached the take-out the day was sunny and warm – it felt like spring. Let the warm weather paddling begin! Nice. Millers is a fun run. It was fun - next time I'll try to run the dam, now that I have seen others do it.